Purge and review process for documents and files. One contact with three or more of the criteria listed below. The group is involved in a pattern of criminal activity (two or more of the felonious acts listed in PC 186.22f). Gang injunctions are civil court orders that attempt to address crime by using a lower legal standard than required by the criminal justice system, resulting in serious civil liberties violations. Law enforcement use them as a tool to label people gang members and restrict their activities in a defined area. Gang injunctions make otherwise legal, everyday activities—such as riding the bus with a friend or picking a spouse up from work late at night—illegal for people they target. A gang injunction is obtained by the City attorney or District attorney who asks a judge to declare that a particular gang is a “public nuisance” and impose permanent restrictions on the targeted individuals’ daily lives. individuals, as well as any community member who lives in or visits the designated area. someone with a crime. Police are left to rely on things like what someone looks like, where they live, and who they know. As a result, there is a great potential for racial profiling, with a particular impact on young people of color. Despite the documented existence of white gangs, no California gang injunction has targeted a white gang. given the opportunity to defend themselves in court prior to being bound by restrictions of the injunction, nor are they provided with an attorney. make it more difficult to avoid gang activity. Gang injunctions are an ineffective law enforcement tool that does not address the root problems of crime and violence. Los Angeles has numerous gang injunctions – more than any other city, yet lost more than 10,000 youth to gang violence in the last 20 years.New York is a major city with the potential for serious gang problems, yet in 2005 Los Angeles had more than 11,000 gang-related crimes, while New York faced 520. What has been shown to work at reducing violence and gang activity is funding social services, such as gang intervention and prevention programs, providing jobs and job training, and providing better educational opportunities for young people. Constant Stops, Pat downs, Arrests & Permanent Criminal Records: Everyone named in an injunction faces regular police stops, questioning, pat downs and arrests. This impacts how they are seen in the community – whether or not they are an “active gang member,” they gain a reputation for being dangerous. Cycling in and out of court and jail can be constant, and totally disrupts their sense of security and stability. Each conviction adds misdemeanors to a record, impacting a person’s ability to access or keep jobs, school or housing. Furthermore, S.D. County jails are severely overcrowded, violent, unhealthy and filled with neighborhood and race politics. The constant contact with the system forces many people further into “gang” politics and violence, it doesn’t offer a way out. Injunctions make it much harder for people to break from the streets or the system and move on with their life in a positive way. Employment, Housing & School: With the constant police stops and frequent violations for people named in injunctions, most people cycle in and out of jail. Many people lose jobs after only a few days of absence from work. Employment discrimination is a reality for anyone connected to the system. Many jobs won’t hire people with court or system involvement; nearly all jobs include questions about past convictions on their applications. Colleges and high schools have strict policies on attendance, and lock-up also causes you to fall behind in your school work and lose your financial aid. Explanations about missing days at work or school due to arrest are difficult to communicate – especially when people have little to no experience with the police or courts, let alone gang suppression policies, and don’t understand that gang injunction violations aren’t for new crimes, but for associating with other people, missing curfews or hanging out on your block. For employers and school officials, your explanations of constant police contact and arrests start to sound like those old “dog ate my homework” excuses. In addition, gang injunction arrests can also lead Public Housing and Section 8 to evict you, and even your entire family; and limit your ability to get into housing. Because injunctions cause so many people to lose their jobs, housing or schooling, they often force people back onto the streets in order to survive. Injunctions make it hard for people to get and keep a legitimate job, attend school and maintain their housing. Family Unity & Connection: Gang injunctions prohibit “association with other gang members” even if those alleged gang members are also family members. It becomes a common occurrence for people to be stopped, questioned, frisked and even arrested within the “safety zone” – the geographic area that makes up the injunction. The fact that family or friends live in the same house or same neighborhood does not protect people from violation. Parents have been arrested visiting their small children. Teenagers have been arrested visiting their parents, uncles or cousins. It is common for family gatherings – birthdays, Christenings, even funerals to be raided and those named in injunctions violated. Ultimately, gang injunctions split families apart. There are ways to prevent violence without injunctions that break families and communities apart and isolate already vulnerable people. Threat of Deportation: The S.D. County Sheriffs now check the immigration status of everyone entering a county jail. Anyone who is undocumented faces transfer to federal detention and deportation. People convicted of violating injunctions, can be deported even if they are here “legally”. Injunctions make staying in the U.S. much more difficult, and increases the likelihood that children will be divided from their parents. gang injunction has been filed in court However, the California Supreme Court has held that gang injunctions are constitutional – despite well-founded concerns about the violation of individual rights. Accordingly, opposing a gang injunction in court at best results in limiting the terms and scope of the gang injunction and historically has not prevented a gang injunction from being issued. Public education regarding gang injunctions, including what they are, the problems they pose, and the need for real solutions. Political opposition targeting city officials, including the City Attorney, the Chief of Police, members of City Council, and the Mayor. Political pressure to adopt prevention and intervention solutions for a community to stop the criminalization of individuals, while providing real services and solutions that address the root causes of crime and violence. community. We will not allow elected officials or governing bodies to disregard our concerns and permit laws, ordinances, injunctions, and/or resolutions to be implemented in our communities without an inclusive and representative community decision process. We demand that city officials attend town hall meetings in directly targeted communities in order to hear a representative voice of the people. Community members’ concerns and plans must be included in any proposed laws, policies, etc. Gang Injunctions in San Diego and the removal of all people in a current gang injunction database. Gang Injunctions do not address the root causes of violence, such as poverty and, unemployment,. We need access to good jobs, quality education, health care, mental health services and affordable housing in order to make our communities safe. miss-education, colonization, lack of family services, and mental health issues. 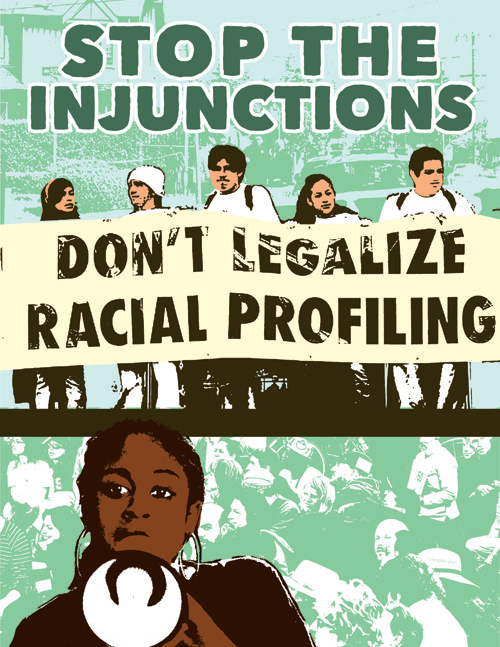 Gang Injunctions are a means for legalized racial profiling, stripping youth and adults of their civil rights. A “war on gangs” is a war on youth and underprivileged communities. Gang injunctions do not work. Studies of gang injunctions in L.A. found that they either did not reduce the incidence of crime/violence in the area, actually increased the incidence or crime or only resulted in a modest decrease in crime. This doesn’t warrant the time and resources put into the injunction in the first place. The City of San Diego does not have the money to implement and enforce a gang injunction. 3. We demand that social and violence prevention programs receive an equal or greater amount of funding as youth and adult incarceration the City of San Diego invest in people, not police and prisons. We insist that the City of San Diego: (1) Allocate a greater amount of resources to support community-based , owned and operated alternatives to the criminal justice system’s mechanism of arrest, prosecution, detention and incarceration. . (2) Invest in youth development, drug treatment, recreation, job placement, tattoo removal, education, youth organizing /leadership and/or cultural arts programs. (3) Separate youth development from law enforcement: Do not require community agencies to share program information, files or youth progress with law enforcement, which has historically been utilized to criminalize youth. (4) Stop increasing funding to police, probation, and sheriffs department prevention and intervention programs. Redistribute these funds to community-based programs, which are less expensive and more effective in developing youth and reducing youth violence. 4. Cease the gentrification of San Diego .We demand access to affordable, safe housing. Our neighborhoods are being flooded with condominiums and unaffordable housing units that drive families, children, working class and poor people out of San Diego. We demand affordable/ low-income housing that takes into account the annual salaries and city living expenses of families and working class people, as well as holding the Planning Department accountable in regards to the environmental impact in a community. We also demand these affordable housing units be inclusive of community programs rather than be utilized as corporate storefronts. .
police officers are held accountable for abusing their authority and using repressive tactics against community members. Members of the Gang Task Force use disrespectful language, threateningly aim guns at individuals, drop people off in “rival territories,” unfairly label people “gang members” in court and in falsified documents, and dehumanize individuals through regular abuse of power. We demand that all police officers are held accountable for their abusive actions through investigations, punishment, and/or termination. 6. We demand the enforcement of San Diego cease any involvement with I.C.E. We want an end to police, sheriff, and I.C.E. collaborations; as well as any deportation raids to cease in our communities. Anyone deported to countries with “zero tolerance” for gang involvement are in danger of being killed by mercenaries and international governments.